HOW TO LIVE IN THAT TINY SPACE? 7 tips to turn your small space into a fun one! The days are shorter. There is a chill in the air. And there are plenty of holiday movies to binge watch on Netflix. Winter is a special time of year when family comes together to spend time at home. Come see our showroom for more sofa bed styles! Don’t settle for cramped family rooms! Learn how to turn your small space into a fun one for the whole family. Is your home a welcoming space for fun indoor activities? Or are you struggling to find room for family time during the winter months? The family room is exactly that – a room for the entire family. Since it’s designed for everyone in mind, it should be a team effort to clear the clutter in the room. Pick a day to spend a couple hours together and clear out the mess. It should take no time at all with everyone pitching in! So what’s the goal of this room? An in-home movie theater? A video game zone? Maybe a little of both? Either way, you want to make sure the room reflects all of the activities your family enjoys together. Once you decide the direction of the room, make a list of everything you need to make the room fun and functional! 3. Organize cords, remotes, and more. Tech has become such an integrated part of our daily lives, it’s almost impossible to remember what life was like before. One of the downsides of a tech life is the cords. You have a cord for your phone, your laptop, your TV, your game console, your tablet…the list is never ending. Make sure you organize all of those cords into easily accessible, yet out of the way spots in the room. There’s nothing worse than tripping over unruly cords while you’re trying to play a game of Twister or settling in to a family movie. A comfy couch is an absolute must for any family room. It’s the place where the whole family gathers for a movie, to play some video games, or spend quality time together reading or doing other activities. In a tight space, you want to make sure your furniture can do double duty. The best solution is a murphy bed. That’s right, you can have the comfy couch your family needs, and also have an additional bed for guests when they come to visit! 5. Get some additional storage. 6. Invest in comfy blankets and pillows. There’s no better way to make a space extra cozy than to have lots of throw blankets and pillows. Who doesn’t love curling up on the couch with a warm blanket and a good book? Or sharing a blanket with your family while you watch a classic holiday movie? You can find great deals on all kinds of throw blankets, and with the right storage, you can make sure your blankets are there when you need them, and are out of the way when you don’t! 7. Make a routine for daily maintenance. Again, the family room is exactly that – a room for the whole family. So make it a priority to work together to help keep this shared space neat and clean! Try a family checklist or chore wheel to keep everyone on track. This way the space will continue to be a source of fun and entertainment for years to come! Ready to enjoy time indoors with family this winter season? 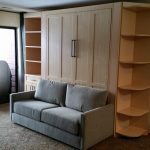 Smart Spaces can show you how you can create a custom murphy bed solution for your unique space. Learn more, here!